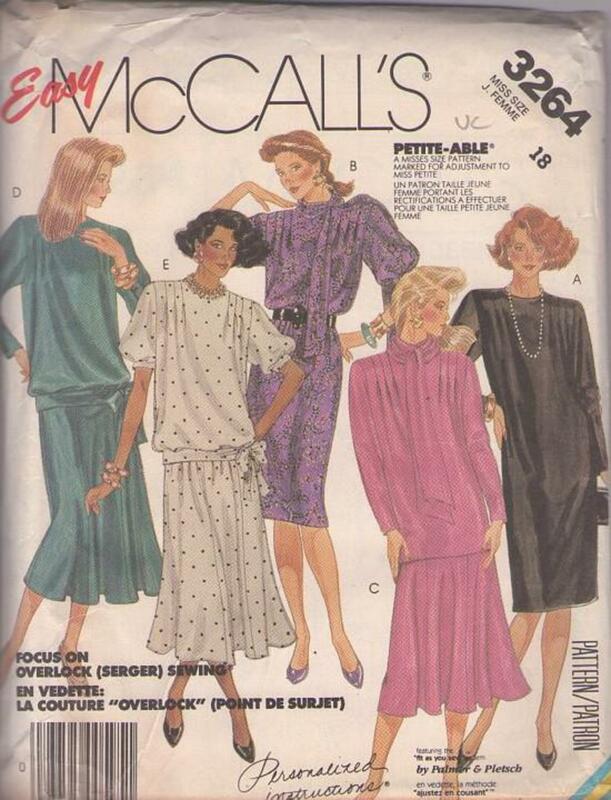 Bust 40", Waist 32", Hips 42"
1987, 80s Evening, Retro Beginners Clothing Patterns - MISSES' DRESS, TOP, SKIRT AND SCARF: Pullover Dress A, B, Top C, D or E has back zipper opening, front shoulder tucks and shoulder pads. Dress A with back vent, Top C or D has long sleeves buttoned at lower edge. Dress B with back vent, or Top E has short sleeves gathered into cuffs. Top D or E is gathered into tied lower band. Pull on fitted and flared gore skirt has elastic in waistline casings and machine stitched hem. Scarf has narrow hem and wrong side of fabric will show.